Welcome to the Stillwater Sunrise Rotary's grant application. This application will help introduce your organization and/or project to our club and provide us an opportunity to consider your proposal. As an active service club in the Stillwater area, we receive many funding requests. We consider each request carefully and do our best to allocate our club's resources (dollars and volunteers) effectively. "The mission of the Stillwater Sunrise Rotary Club is to set the standard for service in the St. Croix Valley through leadership and personal commitment. While maintaining strong fellowship, we focus on addressing real community concerns and ensure that projects we undertake have relevance to and impact on our community. We act in unison among friends and with common goals: to improve the quality of life for all. We are also committed to supporting the programs of Rotary International and the Rotary Foundation to achieve world understanding and peace through international humanitarian, educational, and cultural exchange programs." Recognition/attribution/acknowledgment of this contribution from Stillwater Sunrise Rotary Club should be made whenever possible. 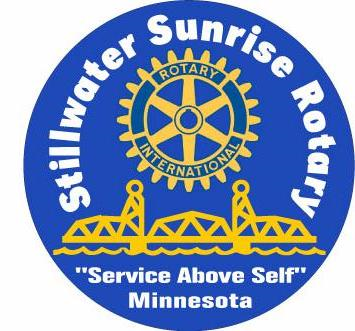 In addition, we invite you to be available to present your program information at a Stillwater Sunrise Rotary meeting or share with us any follow-up story about your project. To request a grant, please click here and submit your request.